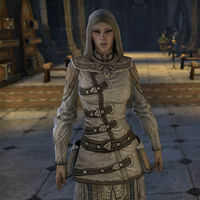 Acolyte Cararilde is an Altmer acolyte who can be found in the Temple of Auri-El in Vulkhel Guard. When you speak to her, she says, "Observations and praises of Auri-El are carried out in this chamber, one of many sites dedicated to his glory. And so, we gather to preserve and prepare this location, and exalt him, so that all may hear our song." This page was last modified on 22 October 2017, at 09:54.